I came to the prospect of having a mother-in-law with some trepidation. At a point in my life when I was bruised and weary, I expected my then-boyfriend’s mother to disapprove of me on sight. When that didn’t happen, I waited for it to occur. By the time I realised we were going to be okay, we had become family. I came to the prospect of having a mother-in-law with some trepidation. At a point in my life when I was bruised and weary, I expected my then-boyfriend’s mother to disapprove of me on sight. When that didn’t happen, I waited for it to occur. By the time I realised we were going to be okay, we had become family. These days,I call my in-laws Mum and Dad and spend half the year living peacefully in their house. I am extremely blessed with my mother-in-law but my pessimism didn’t come from nowhere. Our culture expects and normalises conflict between middle aged women and the (usually) younger women who date, live with or marry their heterosexual sons. One of my own family’s matriarchs was particularly suspicious of any woman who came near her three sons. If one of her sons or grandchildren disappointed her, then the son’s wife or girlfriend was to blame. None of these women were ever good enough. There were periods where their names could not be mentioned in her presence. Following one family event that she couldn’t attend, the old lady had to be given a special edited version of the video, so she wouldn’t know that her forty-year-old son had brought along a certain girlfriend. Lucy’s story of her relationship with her mother-in-law is heart-breaking, as Lucy looks to a future where her mother-in-law will always be a part of their lives, even though she told Lucy to let her husband go (regardless of his feelings), shortly after Lucy lost the use of her legs. Families are complicated and any familial relationship can be problematic, but it’s not an accident that so many advice column inches and even books are dedicated to the mother-in-law/ daughter-in-law dynamic. So why is there often a problem there? While many of the traditional rituals of marriage treat women like passive children being handed from the care, protection and possession of a father to a husband, there’s the parallel idea that men are but boys, and when they move in with a romantic partner, that partner takes over their care and control. While there are many comic depictions of the dynamic, Marie and Debra’s relationship in US sitcom Everybody Loves Raymond is archetypical: Mother-in-law Marie is concerned that her forty-year old baby might not be properly fed or taken care of, while Debra blames her mother-in-law for her husband’s immaturity and idleness. Advice columns discuss the jealousy of a mother-in-law for her daughter-in-law as if that’s entirely natural and healthy; the older woman is being usurped by a younger one. The tag line to one self-help book on mother-in-law relationships reads “Can two women love the same man and still get along?” Well, so long as you don’t marry Oedipus. Indeed, from my limited and purely observational experience, the mother-in-laws from hell I’ve known have been women who haven’t been able, through upbringing and culture, to move on from their now defunct role as the mother of young children. They are less likely to have had fulfilling work, hobbies or community involvement outside the family, and it is essential to their understanding of self that they continue to be heavily involved in the care of their adult sons. In turn, the criticisms made of daughter-in-laws tend to be inherently sexist. Lucy’s mother-in-law didn’t criticise her ability to earn a lot of money or put up shelves. Instead, it is because disability prevents Lucy from being a certain kind of wife – she can’t ‘be part of the great soap opera of life’ (which sounds to me like they get to space dramatic revelations, murders and the interference of evil twins evenly throughout the year, instead of everything always happening at Christmas). Carolyn Bourne’s now famous e-mail missive to her stepson’s fiancé (the pair since married in her absence) was as much about gender as it was about Bourne’s ideas of class: It could be summarised as “You’re unladylike, you’re calculating, you’re inappropriate, you make a fuss about your health and you draw attention to yourself” – things that men are far less often accused of. Meanwhile, “poor Freddie” is to be pitied, as a mere mortal man, who couldn’t possibly know his own mind about the kind of woman he should marry. A big part of the problem is the normalisation of these conflicts. Women aren’t supposed to get along – it’s rare enough we even talk to one another in films – and women from two generations are bound to dislike one other. When we believe a problem is normal, however badly individuals might behave, we’re less likely to try and sort it out. Well, that’s mother-in-laws for you, isn’t it? The misogynistic idea that middle-aged or elderly women are bound to be bitter, jealous busy-bodies who are best ignored or mocked will be sometimes be self-fulfilling, until the roles of older women are seen as far more numerous, variable and valuable than merely mothers whose babies are now adult men. 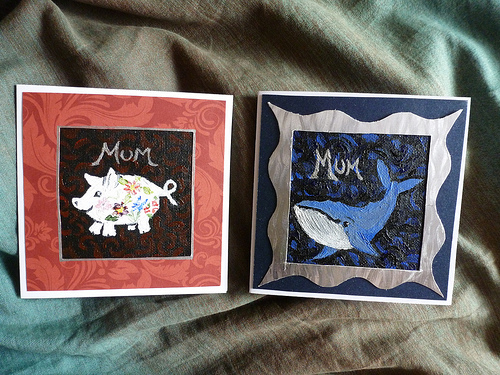 Image by the author shows two home made mothers’ day cards.